SHARPSBURG, Md., Sept. 8, 2012 — One hundred and fifty years ago next week, soldiers from both sides of the Mason Dixon Line gathered to wage battle at Antietam National Battlefield in the War Between the States. Regardless of the reason or reasons for the conflict, it was clear that the majority of those fighting for the North and those fighting for the South were on different sides of many issues. 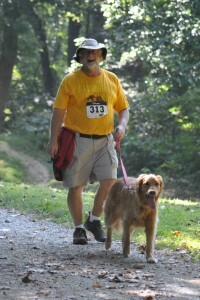 Tom Gerhold, 55, of Smithsburg, Md., and his dog, Max. On Saturday, though, a total of 166 runners and walkers — from across the expanded union — gathered near that same spot to support a single cause: the family of the late U.S. Park Ranger Margaret Anderson, who was killed by an assailant on Jan. 1, 2012, while on duty at Mount Rainier National Park. Anderson was employed by the National Park Service and previously served along the C&O Canal National Historical Park. Her husband, Eric Anderson, previously worked at Antietam National Battlefield before being reassigned to Washington. Margaret Anderson is survived by her husband and two daughters. 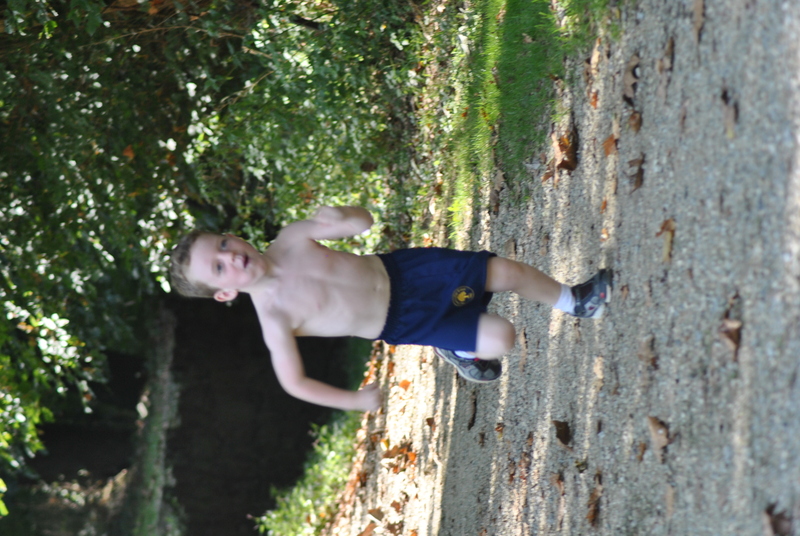 The proceeds from the event, which traveled 3.1 miles along the C&O Canal towpath, went to Anderson’s family, said Tom Shantz, race director. 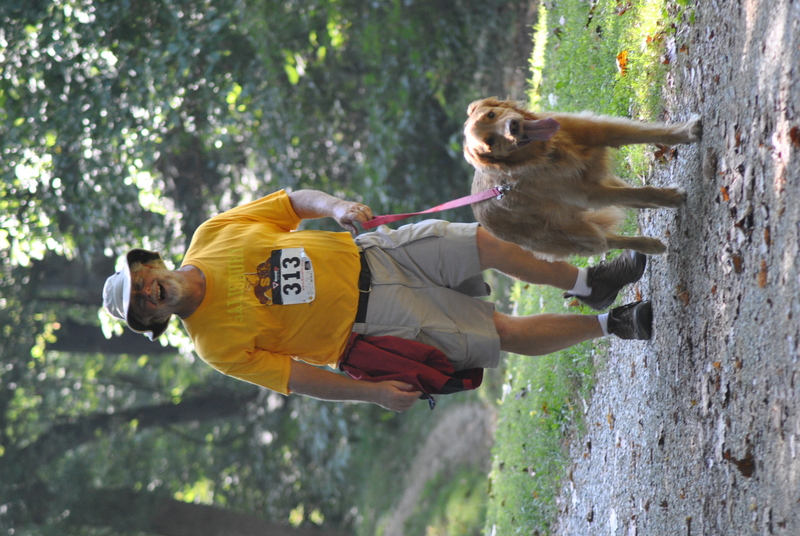 Shantz concocted a course that put participants on a point-to-point trail, covering 3.1 mies and finished at a point just shy of the Rumsey Bridge that connects Maryland and West Virginia. Unlike other issues that result in a split opinion, runners and walkers from Maryland, West Virginia, Pennsylvania, Virginia and as far away as Kentucky, Lousiana and Texas joined in supporting the Andersons and National Park Service personnel in general. The 5,000-meter run was won by 31-year-old Kearneysville, W.Va., resident John Cullum. He posted a time of 20 minutes and 17.2 seconds and edged runner-up Cody Marsh, 20, of Harpers Ferry, W.Va. Marsh stopped the clock in 20:35.5 — easily outdistancing third-place finisher Brad Hopkins, 37, of Martinsburg (21:34.5). 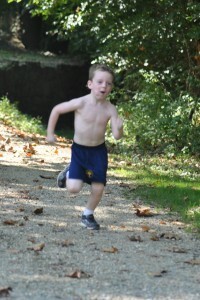 Michael Seamus Flynn, 5, of Jeffersonton, Va.
Clint Burkholder, 32, of historic Gettysburg, Pa., took fourth in 22:13.6 while 59-year-old Donald Briggs, of Shepherdstown, earned the men’s masters title in 22:19.2 and a fifth-place finish overall. Danielle Khoo, 20, of Frederick, Md., placed 12th overall and won the women’s title with a time of 23:41.2. 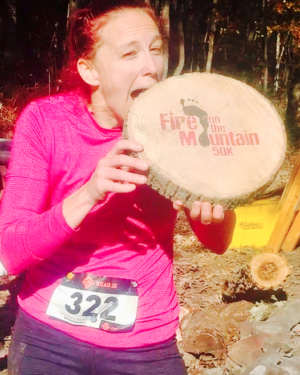 Jennifer Joyce, 39, of Sharpsburg, was second (and 17th overall). Joyce finished in 24:12.7, one spot ahead of Tessla Pitman, 32, of Idamay, W.Va., who stopped the clock in 25:07.2. Peggy Gordon, 47, of Shepherdstown, took the women’s masters crown with a time of 27:50.1 — good for 35th overall. Where: Parking will be on the grounds of Ferry Hill, across the Potomac River from Shepherdstown, WV. 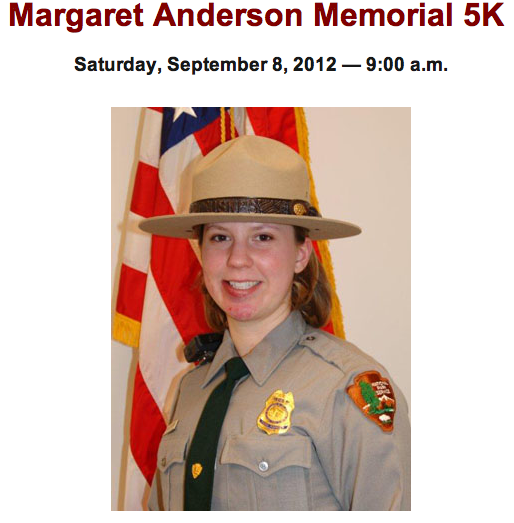 What else: This event is held in memory of Margaret Anderson, a respected Law Enforcement Ranger for the National Park Service and devoted wife and mother, who was slain in the line of duty on Jan. 1, 2012. All proceeds from this event will be donated to Margaret Anderson’s family. SHEPHERDSTOWN, W.Va., Sept. 8, 2012 — Park Ranger Margaret Anderson was shot and killed while attempting to stop a fleeing suspect near the Longmire Ranger Station in Mount Rainier National Park, in Pierce County, Washington, at approximately 10:30 am. When the suspect reached Ranger Anderson’s roadblock, he made a U-turn, exited his vehicle, and opened fire. Ranger Anderson was shot before she was able to exit her patrol car. After being shot, Ranger Anderson radioed for help as the suspect fled on foot. Responding units attempting to reach Ranger Anderson were held at bay for approximately 90 minutes as the suspect continued to fire on them. The suspect’s vehicle was recovered with additional weapons and body armor inside. The suspect’s body was found the following day about six miles from the initial shooting scene.